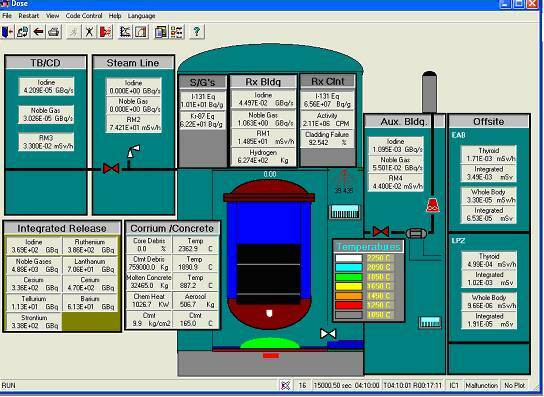 The PC-based reactor simulation software PCTRAN was recently expanded to cover light water advanced reactors. The plant models include Generation III+ advanced PWR and BWR. The evolutionary designs are Areva EPR and GE ABWR by adding cooling path redundancy and devises for severe accident mitigation. One-step further is the passive-cooled Westinghouse AP1000 and GE ESBWR. Combined with PCTRAN’s models of experimental pool reactor and conventional PWR and BWR with server accident and dose dispersion capability, it forms a complete series for education in nuclear technology. The PC-based simulation system helps to train the first generation of technical staff for countries entering the nuclear era. PCTRAN is a PC-based simulation code using reduced thermal hydraulic nodes for transient prediction. Advanced technique significantly simplifies numerical solution process. Since its first introduction (Po 1988), it has evolved from DOS to Windows-XP environment. Operation is in standard Windows graphical-user-interface (GUI) for friendly interactive control. For training and education of the first generation of technical staff in countries emerging into nuclear power, PCTRAN is a “live” simulation tool complementing classroom lectures. Concepts of neutron multiplication, criticality, feedback, decay heat and Xenon poisoning can be demonstrated in PCTRAN’s experimental pool reactor model. For that many of the countries have already operated for years with ample experience. Next there are conventional PWR and BWR models. In addition to normal operation of start-up, power manoeuvre and shutdown, operational transients and accidents can be simulated at a speed faster than real-time. The severe accident model allows core-melt and containment failure in the event of multiple failures of the emergency core cooling system or human error. Anticipating second coming of nuclear era, new constructions are likely advanced models with additional core-cooling redundancy and passive devises. There are European, Russian, Japanese and Korean designs of evolutionary PWRs with improved ECCS and containment designs. The calculated core degradation frequency (CDF) is reduced by one order of magnitude (to 10-6 /year) than the conventional PWR’s. Westinghouse AP1000 (Westinghouse 2004) uses passive heat sink and natural forces to remove decay heat. On the BWR side there is General Electric/Hitachi Advanced BWR (ABWR) with reduced piping and enhanced severe accident mitigation capability. Using the same passive concept, the Economical and Simplified BWR (ESBWR) also eliminates active ECCS. Its CDF is reported down to 10-8 /year (GE/Hitachi 2005). In this paper the experimental pool, AP1000 and ABWR are selected for presentation. 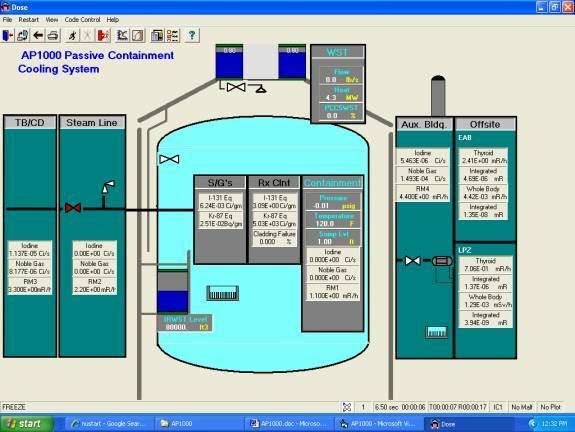 In order to cover nuclear safety all the way to general public, radiological release from severe accident and offsite dose dispersion forms the integrated PCTRAN simulation system. 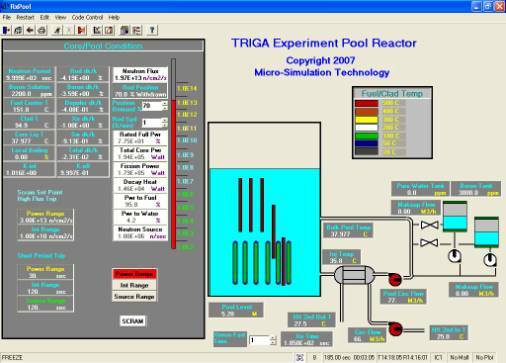 Since 1996 the International Atomic Energy Agency (IAEA) has selected PCTRAN as the training material in its annual Advanced Reactor Simulation Workshop (Cleveland 2006). Over the years a number of institutions all over the world have licensed various models into their curricula. As the Gulf States are in the dawn of nuclear power development, it could contribute further in the region’s education and development. Execution is default to real-time speed. It could be accelerated to 2, 4, and 8 or up to16 times faster for long transients. All automatic and manual actions are recorded in a log text file. Transient curves can be transferred conveniently through Office Suite over a network. Online “Help” is provided that assists comprehensive user’s manual for easy instruction. The reactor is rated at 200 KW thermal with neutron flux at 2x1010 n/cm2/sec. It is intended for education of reactor principles, isotope production and research in irradiation. Concepts of delayed-neutron effect, multiplication factor, control by rods and boron concentration, feedback on fuel (Doppler) and moderator temperatures, criticality, xenon and samarium poisoning, etc. can be demonstrated. Delicate manoeuvre of the rods during start-up to criticality is possible. It is a powerful tool complementing classroom lectures. The database is structured to allow varying the reactor size from a few kilowatts up to megawatt range for any specific pool reactor. Westinghouse AP1000’s nuclear and secondary steam supply system (NSSS) is similar to a conventional PWR. The core is rated at 3400 MWt or 1000 MW electric at full power. The reactor primary coolant has two steam generators with four coolant pumps (2x4 configuration). PCTRAN’s Figure 2 right hand side control panels are for normal operation. There are rod control system, pressurizer and steam generator pressure and level controls to keep the plant at desired operating condition. The Chemical and Volume Control System (CVCC) panel is located in the lower left. It is composed of charging pumps and letdown valves for reactor coolant purity and inventory control - the same as conventional PWR. At left there are panels for the passive emergency core cooling systems. At top there is In-Containment Refuelling Water Storage Tank (IRWST). Two Passive Residual Heat Removal (PRHR) heat exchangers are submerged in the IRWST. Three stages of Automatic Depressurization System (ADS) on top of the pressurizer are provided to relieve steam into the IRWST. The fourth-stage ADS valves are connected to the hot legs and relieve steam directly into the containment atmosphere. They are opened in sequence during a small break loss-of-coolant accident to accelerate depressurization. Instead of an active high-pressure injection system that requires safety-graded pumps and emergency AC power supply, a passive system of Core Makeup Tanks (CMT), accumulators (ACC) and drain valves from the IRWST are provided. Their respective panels are located in the middle-left section. Depending upon extent of pressure reduction following a LOCA, CMT, ACC and IRWST drains are initiated in sequence to provide coolant makeup into the core. For containment cooling the reactor building is designed as a Passive Cooled Containment System (PCCS). Different from conventional PWR, the containment spray is applied on the outside shell of a steel lining. The PCCS water storage tank is located at the top of the concrete structure. For a design basis scenario, it is activated in the event of high-pressure reading within the containment. It would take place if the normal heat removal (the containment fan coolers) unavailable for an extended period of time. The heat transfer is enhanced by a water film formed by gravity drain of water onto the containment shell. The tank has sufficient water to provide three days of cooling. The atmosphere is the ultimate heat sink for the reactor system. In PCTRAN AP1000 containment mimic (Figure 3), the valve colour changes and digitally displayed flow rate indicates activation of the passive systems. The containment concrete structure with the baffle provides for natural circulation of outside air. The air enters into the gap between the concrete containment and the baffle at the top, flows down the outside of the baffle, and rises up along the steel containment vessel. The heat is thus transferred through the containment vessel to the environment. The plant model is the General Electric (GE) designed Advanced Boiling Water Reactor (ABWR) plant of 1350 MWe. The reactor uses 10 reactor internal pumps that reduce probability of external pipe break. A containment overpressure protection system is designed to mitigate consequence of a severe accident. The Standard ABWR Final Safety Analysis Report (FSAR) and Taiwan Power Company’s Fourth Nuclear Power Plant Lungmen Project was used for PCTRAN-ABWR model input. The upper and lower drywell is modeled in the containment model. The suppression pool (wetwell) surrounds the drywell. Horizontal vents connect the two compartments. There are vacuum breakers to balance the pressures of the two compartments after a major blowdown. The nuclear steam supply system is designed in a mimic as shown in Figure 4. 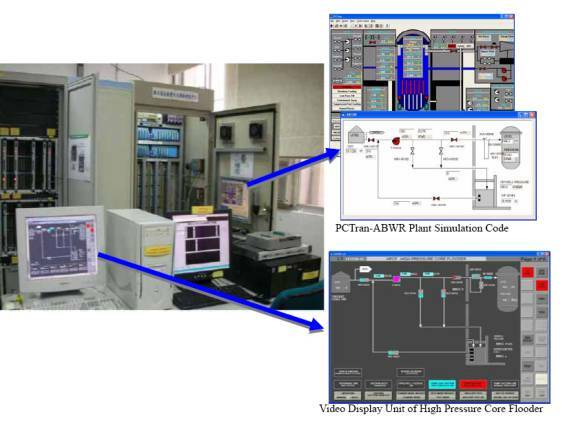 PCTRAN/ABWR was used for verification and validation of Lungmen Project’s instrumentation and control system software at the Institute of Nuclear Energy Research of Taiwan (Huang 2007). A severe accident is defined as beyond design-basis with significant core damage and containment failure. A borderline is usually set in probability safety assessment (PSA) Division 2 for top of the fuel (TAF) uncovery, and Division 3 for fission product relocation. During the clad heat-up Zirconium may interact with steam to generate hydrogen and release more heat into the system. The core is modelled into six vertical nodes. Each one will generate a portion of the decay heat. When the boundary heat removal rate is less than the core heat, the core node is heated up to the point of melting. Molten fuel may collapse into the bottom of the vessel. The vessel lower head may then heat up to the melting point, too. The molten debris may break the vessel bottom and drop into the containment cavity floor. During the fuel damage process, first the fission gas in the clad may leak out. Later if the fuel and cladding continue their degradation, fuel isotopes will release also. In addition to iodine and noble gases, there are alkali metals, tellurium, barium, cerium, lanthanides, etc. The elevated concentration of these radioactive isotopes would find their ways through the vessel break, relief valves, and containment leakage into the environment. In PCTRAN they are weighted and lumped together into a single form representing progression of CCI. In the core Zr-water reaction calculation, cylindrical geometry has been used for vertical tube bundle configuration. For CCI it is instead a semi-hemisphere configuration to represent the slump pile of debris. The top hemisphere interacts with atmosphere above, and the bottom flat surface interacts with concrete floor. A red slab represents the molten pool of concrete in Figure 6 mimic display. Having generated the release source term from a power plant, the Gaussian puff model and numerical techniques (Cheng, 2008) are utilized to calculate the radioactive effluent dispersion. During the transient simulation, puffs are sequentially generated and dispersed in all directions governed by the Pasquill stability category, wind velocity and wind direction. The thyroid dose rate and whole body dose rate (as well as their accumulations) at every spatial location in the neighbourhood are shown as a color-shaded plot (Figure 7). The releases of radioactive materials are treated as unsteady emissions in non-homogeneous dispersion conditions. The meteorological condition can vary between Pasquill stability category A (most unstable) to F (most stable), wind speed in meters per second and release elevation from ground up to a few hundred meters. The Gaussian puff model is used to predict the time-varying dose distributions. It is more realistic than the Gaussian plume model that assumes the emission is continuous and constant in steady-state meteorological conditions. The model describes the effluent dispersion in the horizontal and vertical directions. It is two-dimensional semi-infinite sphere with elevated release. The projected dose rate and integrated dose are used for emergency activation level determination and recommendation of shielding or evacuation during an exercise (Po 2008). Other than the generic version acquired by IAEA and taught in its workshop for the pass twelve years, various models have been licensed to universities all over the world. These include universities of Cincinnati, Georgia Tech, Lowell, Michigan, MIT, NJIT, North Texas, Rensselaer Polytechnic and Naval Academy in the US; Fukui Tech, Kobe Shosen, Kyushu, Osaka, Tokyo, Tohoku and Tokyo IT in Japan; Tsinghua (Beijing), Tsinghua (Taiwan), SJTU, XJTU, Hong Kong U and HK City U in China; Polytechnic Madrid and Polytechnic Barcelona in Spain; Sharif of Iran; King Abdulaziz of Saudi Arabia; Chulalongkorn of Thailand and Sherbrooke and McMaster in Canada. These institutions have used the executable programs and accompanied documentation as teaching aid in their reactor physics and nuclear power plant technology classes. Some of them have further acquired external sponsors’ financial support for licensing the source codes and assistance from Micro-Simulation Technology. Their faculty and graduate students have then developed advanced models and specific applications using PCTRAN’s Visual Basic platform. Over the years two PhD’s and dozens of Masters have completed their thesis. Examples are Taiwan Tsinghua’s contribution in the puff dispersion model (Cheng 2007) and a fault detection system for Lungmen Project’s (ABWR) I&C system (Huang 2007). University of Cincinnati has contributed in the severe accident model. PCTRAN was first introduced to King Abdulaziz University via IAEA’s sponsorship in 1998. As the Gulf States are in the dawn of nuclear power construction, it could contribute further in the region’s nuclear education and development. PO L. C., Koske J. Simmons K. (2008), A Comprehensive Nuclear Plant and Radiological Release Consequence Projection System, American Nuclear Society Emergency Management and Robotics Conference in Albuquerque, New Mexico, USA, March 9-12. Taiwan Power Company (2000), Lungmen Final Safety Analysis Report. 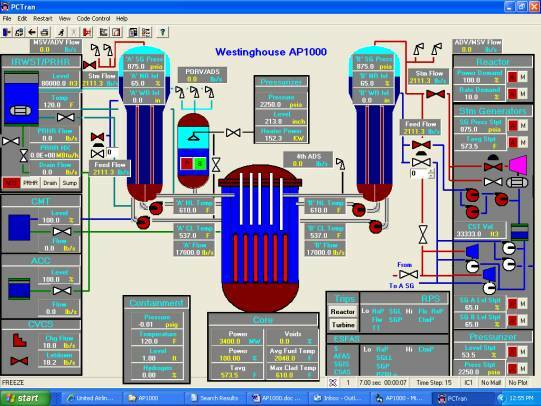 Westinghouse Electric Company (2004), AP1000 Design Control Document, APP-GW-FL700.